An LVN program in Texas, like other similar programs across the United States prepares students to become efficient professionals in the healthcare field. This program helps give basic nursing care to patients in hospitals and other medical related settings. Students in the state of Texas normally complete an accredited LVN program successfully in one or two years. If you have decided to enroll in an lvn program in Texas, the first step you need to take is to find out which schools or colleges offer this program. They must be accredited by the Texas Board of Nursing. The Texas Board of Nursing performs the dual function of approving nursing schools, as well as provides licensure to graduate nurses who have completed accredited LVN programs. You can also find a list of all the schools that provide approved LVN programs, accredited by the Texas Board of Nursing, on the board’s official website. How can you get admission into an LVN program in Texas? What can you expect to learn from LVN programs being offered in Texas? There are several types of LVN programs currently being offered in Texas. These programs include a diploma or certificate program and an LVN associate’s degree program. The syllabus of an LVN diploma or certificate has been devised in such a way that it focuses on courses such as pharmacology, physiology, medical nursing and human anatomy. Almost all of the schools that offer this program, in addition to theoretical coursework also include practical or clinical classes. These classes prepare students for real world scenarios. Students learn how to apply theoretical coursework in medical or hospital settings. The curriculum of an LVN associate’s degree program may be successfully completed in two years. In addition to building upon the basic foundation and focusing on core topics related to vocational nursing such as fundamentals of vocational nursing, adult health and client care, the associate’s degree gives the students a well rounded perspective by introducing them to general coursework such as mathematics, English language, communication, microbiology and social science. Some schools also include topics such as advanced pharmacology and physiology. These act as foundation units or prerequisites for a bachelor’s degree in nursing science. These LVN programs also emphasize on building indispensable skills in the students so that they may be able to become efficient professionals in the field. These skills include detail orientation, patience, speaking or communication skills, interpersonal skills, compassion for patients and physical stamina. The next step for students after completing an accredited vocational nurse program is to apply for licensure. In order to acquire a vocational nurse license, the students must pass the National Council Licensure Examination, more commonly known as the NCLEX-PN. This licensure requirement is valid through all the states. Although getting certified is not obligatory for a licensed vocational nurse, acquiring a certification in related areas such as IV therapy and gerontology may confirm comprehensive knowledge and professionalism. According to the website O*NET Online, 738,000 people were employed in 2012 as licensed vocational and practical nurses. The US Bureau of Labor Statistics (BLS) concluded that the top 10 percent licensed vocational and practical nurses working in Texas made more than a median salary of $58,500 in 2013. O*Net Online projected 363,100 new job openings in the United States for licensed vocational and practical nurses from 2012 to 2022. BLS estimated that this employment growth rate is approximately 25 percent and thus is much faster than the average employment growth rate of all occupations. LVNs in Texas have consistently earned more over the years. 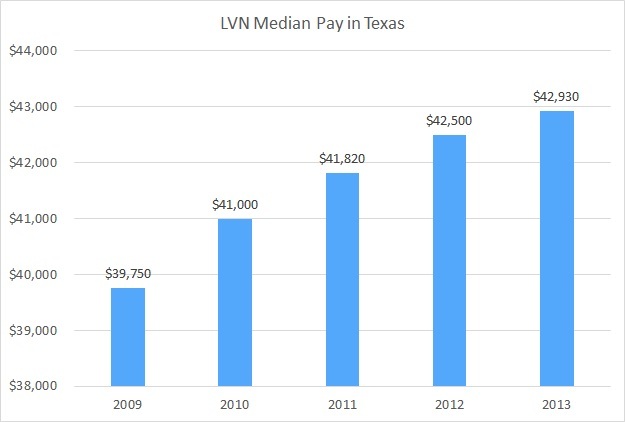 Statistics show that LVNs in Texas have earned an increasing median annual salary from 2009 to 2013. In 2009, LVNs earned $39,750 while in 2013, they earned $42,930. Q:Can you tell me how to become a LVN in Texas?